1996 Haas VF-4 4-Axis CNC Vertical Machining Center s/n 8042 w/ Haas Controls, 20-Station ATC, CAT-40 Taper Spindle, 15Hp High Torque Motor, Rigid Tapping, Graphics, Programmable Coolant Nozzle, Chip Auger, 18” x 52” Table. Ta-Shing “Crown 4/2000” Geared Head Gap Bed Lathe s/n C40105 w/ 3” Bore Thru Spindle, 11-1500 RPM, Inch/mm Threading, Tailstock, Steady and Follow Rests, KDK Tool Post, 12” 3-Jaw and 12” 4-Jaw Chucks. Mori Seiki ML-850 16” x 36” Geared Head Gap Bed Lathe s/n 3376 w/ 77-1834 RPM, Inch/mm Threading, Tailstock, Steady Rest, KDK Tool Post, 8” 3-Jaw Chuck. LeBlond Servo-Shift 15” x 32” Lathe s/n 7C1946 w/ 45-1800 RPM, Taper Attachment, Inch Threading, Tailstock, 5C Collet Closer, KDK Tool Post. Ucima mdl. R1200L 30-40 7 1⁄2” Column x 39” Radial Arm Drill s/n 48-682 w/ 40-2000 RPM, Power Column and Feeds, 18” x 21 1⁄2” x 19 1⁄2” Tooling Base, 25” x50” Base Area. Ingersoll Rand mdl. 7100 15Hp Horizontal Air Compressor s/n 0309120059 w/ 120 Gallon Tank. Marvel mdl. 8/M4 18” Sliding Miter Vertical Band Saw s/n 810777 w/ Manual Clamping, 3-Speeds, Conveyors. Armstrong-Blum 18” Sliding Miter Vertical Band Saw w/ Manual Clamping, 3-Speeds, Conveyors. Evans Machinery mdl. 0710 15” Sliding Arm Saw w/ 4’ x 8’ Table. Davis & Wells mdl. DB-20-64 19” Vertical Band Saw s/n 20B-518-80. Delta/Rockwell 10” Unisaw Table Saw w/ Dust Collector. Rockwell 3-Head Gang Drill Press. Rockwell mdl. 15 Drilling and Tapping Machine. Clausing Variable Speed Pedestal Drill Press. Betenbender mdl. 6-3/16 6’ x 3/16” Cap Hydraulic Power Shear s/n 165600 w/Digital Back Gage, 48” Squaring arm and Front Supports. Center Engineering “Metal Muncher” mdl. MM61F 49-Ton Hydraulic Ironworker /n 2551-2-78 w/ 13/16” thru 3⁄4” to 1 1/16” thru 1⁄2” Punch Cap, 1” x 6” to 3/16” x 22” Flat Shear Cap, 1 1⁄4” Square and 1 3/8” Round Bar Shear Cap, 36” Press Brake Attachment, 3” x 3” Notcher. Enterprise type PP-55-75-10-ACB 55-Ton OBI Stamping Press w/ 3 15/16” Stroke, 50 Strokes/Min. Bridgeport Series I – 2Hp Vertical Mill s/n 186983 w/ Mitutoyo DRO, 60-4200 Dial RPM, Chrome Ways, Power Feed. Bridgeport Vertical Mill s/n 86336 w/ Mitutoyo DRO, 1Hp Motor, 80-2720 RPM, 8-Speeds. Bridgeport/Vertmill Vertical Mill s/n 581796 w/ 1Hp Motor, 80-2720 RPM, 8-Speeds, Power Feed. Tree 2UVR Vertical Mill s/n 7245 w/ 1.5Hp Motor, 60-3300 RPM, Power Feed, 10 1⁄2” x 42” Table. Shizuoka mdl. SP-CH Universal Mill s/n 1942 w/ 78-1200 RPM, Universal Vertical Milling Head, Power Feeds, Arbor and Supports, 40-Taper Vertical and Horizontal Spindles, 11” x 43” Table. Sajo mdl. 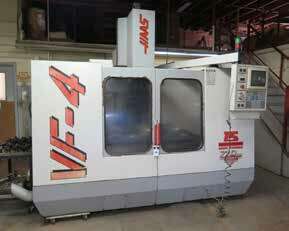 UF-53P Horizontal Mill s/n 12 w/ 39-1500 RPM, 40-Taper Spindle, Power Feeds, Arbor and Support, Coolant. 48” x 16GA Finger Brake. 6 1⁄2” x 6 1⁄2” Corner Notcher.